As the world of snowboarding/skiing continues to develop, so does the world of action cameras. Every adventure enthusiast out there in the world today has used an action camera to record memories at some point or the other. GoPro has been the undisputed king of action cameras for quite a few years now, and you can understand why extreme sports fans swear by it only after you have used one of their products yourself. But then, a GoPro camera is only as good as the accessories you use with it. Regardless of whether you possess the latest Hero models or are still using the old Hero 4, you can transform your GoPro into a fantastic device to have while on a vacation. 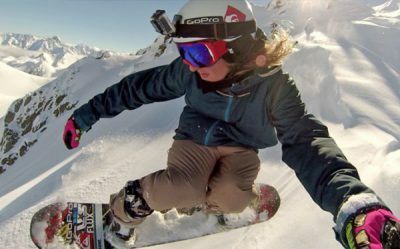 It;s true that this article only talks about GoPro accessories but the below list will work with other action cameras brands as well, you can check my list of best action cameras for skiing and snowboarding to get an idea of the cameras you can use for these awesome winter sports! This article goes out to all the winter sport lovers who are planning to hit the snow with their GoPro this winter. 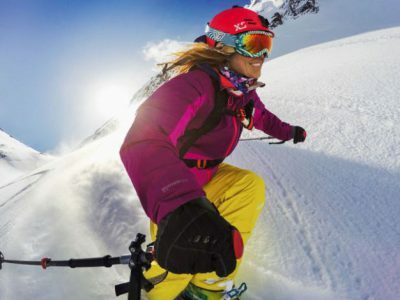 Let me show you my pick of the best GoPro accessories for skiing and snowboarding. The importance of understanding the actual use of your snowboarding accessories cannot be emphasized more. It is absolutely useless to buy a chunk of expensive gadgets without properly comprehending the reasons for buying and the benefits of each. You do not want to plan for weeks only to end up with an ordinary, unexciting video clip despite having all the sleek accessories at your disposal, right? Action cameras are meant to be compact and portable, and that’s how they should be even after adding a mount. It is necessary to keep in mind not to spend your earnings on bulky gadgets since they will be rendered useless on your skiing expedition. Also, you need to realize what kind of POVs you are looking for before buying a mount. Some mounts will position the camera away from you, some will help you click selfies while others will position the device at awkward angles as needed. Chest mounts, for instance, will provide only forward-facing shots while handheld gimbals can be used to mix and match footage from different angles. Mixing up different POVs is usually the norm in order to create entertaining footage. However, if you are inclined to use only a single POV, you need not purchase the accessories that offer you something else. Helmet mounts can be very effective if you want them to be, or very boring if you don’t know how to use them. Usually, people mount the camera in front of the helmet so that the POV is almost precisely what the rider sees. The rider’s perspective can be a fantastic angle to alternate with POVs from pole mounts, but you will need a second camera in order to do that. Helmet mounts usually come with a head strap to fix the camera. Alternatively, you can use an adhesive mount as well if you feel the head strap is giving you shaky footage. Adjusting the strap and securing the camera firmly, however, solves this issue more often than not. If you are inclined to be a bit more creative with your head mount, you may want to try mounting your GoPro at the side, which will give you a side facing POV. This also works if you attach a pole with your helmet and mount the camera on it so that it looks back at you. This basically creates the selfie effect while keeping your hands free. GoPro’s head strap mount works with all the Hero models and is relatively cheap on Amazon. It seems durable with tough poly-carbonate buckles and non-slip rubber inserts on the nylon straps. If you are willing to purchase a helmet mount for your skiing exercises, now is the time to grab your opportunity. Let’s face it. 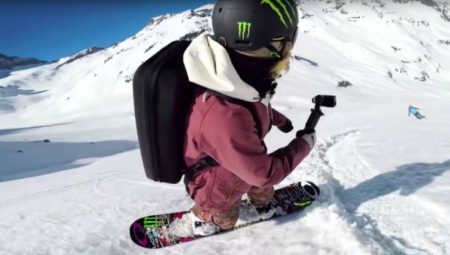 Chest mounts are the best mounts for shooting your video while snowboarding. The POV is such that the camera records a decent amount of your body, including the arms and legs, while also providing a reference point to the footage. Further, unlike other mounts like the GoPro Karma Grip, chest mounts leave both your hands free, thereby making the footage more natural. Indeed, chest mounts have become extremely popular not only among snowboarders but also among action photography enthusiasts in general. The GoPro Chest Mount Harness is easy to wear, lightweight but quite sturdy. It is currently one of the most popular chest straps available in the market for capturing mid-range front-facing POV shots. The straps are stable, comfortable and fully adjustable. This implies, you no longer have to worry about whether it will fit your size. The footage may tend to get a bit bouncy at times; so make sure you have firmly secured the harness. Chest mounts are known to create the best video shots during skiing. This is because they record exactly what is happening in front of the skier. However, using it as the only POV for an entire video may end up being too monotonous. It is advisable to use this POV when you want to focus on the rider doing his trick shot or hitting a rail. It is the versatility of the pole mount that makes it indispensable to your luggage. Not only can you use it to shoot your friends or the scenery, but also use it to record yourself. 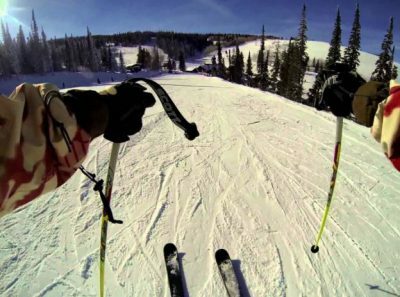 Most professionals use the ski pole POV as a secondary shot to enhance and spice up the original footage. Ideally, you want the pole mount to be kept around half a feet above the snow before panning the camera up as the rider approaches the feature. There are other ways to capture shots as well, most of them adding versatility to your original chest or helmet mount footage. 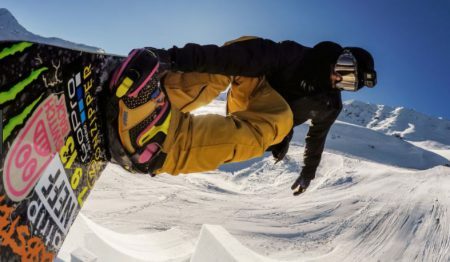 Some snowboarders recommend tilting the camera upside down while capturing others’ footage since it helps to counterbalance the weight, but you need to be mindful of the lateral rotation that may creep in as the camera hangs freely. This is where things begin to get a bit quirky. Snowboard mounts provide a creative POV that may help you engage your audience and render a personalized touch to your video. It does come with its own set of cons though. Snow globs frequently accumulate, hiding half of your image and essentially ruining the entire footage with that blind spot. Further, many snowboarders have complained that the mount easily comes off while skiing. The adhesion problems are a serious issue, not only because you won’t get the footage you were looking for, but also because it runs the additional risk of destroying your camera. Considering the price of a GoPro device, who would want that? Swivel extension mounts provide a selfie POV. They provide somewhat of a reverse bobble head image with as much as 360 degrees of adjustment. You can capture yourself as well as a chunk of the scenery behind you without any added effort. This kind of POV adds the fun element to your skiing videos. Swivel extension helmet mounts come with a lock design; so you can keep the angle fixed or let the camera swivel in front of you. The jutting-out model may be a bit of a discomfort while navigating through trees, but that’s not much of an issue when the path in front is clear and wide enough. People comfortable with one handed filming often prefer the Remote Poles from SP Gadgets. If you aren’t a great skier, chances are you will need your other hand free in order to maintain balance. The SP Gadgets remote pole lets you do exactly that. They also house the Wi-Fi remote that comes with the GoPro Hero models so that you can access it easily with your pole hand. The twist lock mechanism makes sure it doesn’t come off easily. Most importantly, it is compatible with even the older GoPro models like Hero 2 and Hero 3. Just like snowboard mounts, boot mounts also offer nifty perspectives that your viewers won’t see coming. They are easy to fix – you can secure the camera to your boot using the helmet strap. It is always advisable to use two straps to fasten the camera as tightly as possible so that it doesn’t fall off midway during the shoot. There are a number of DIY videos on the internet if you are looking to mount your camera on your boots on your net skiing expedition. 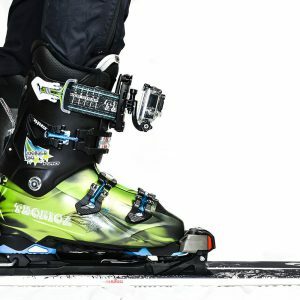 The disadvantage of using boot mounts is similar to that of using snowboard mounts. 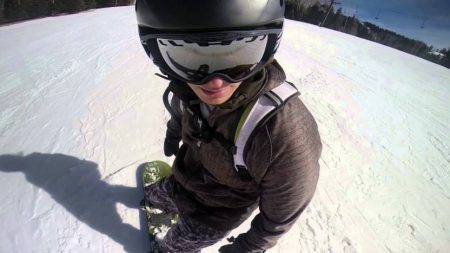 While it offers a platform to showcase your creativity with a unique POV footage, it does run the risk of snow globs obstructing the image. The GoPro Karma Grip is one of its kind when it comes to handheld GoPro gimbals. It is solid, rugged, and sleek in design. If you are not a fan of pole mounts, or do not use poles at all, the Karma Grip is the gimbal you are looking for. 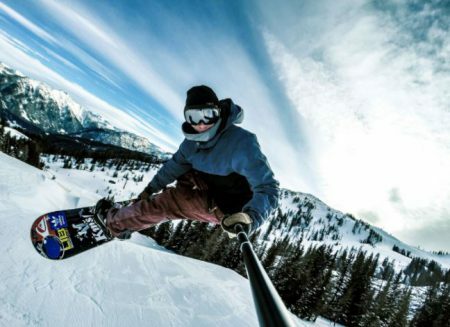 Just like pole mounts, it lets you capture the scenery, footage of your friends skiing, and even offers a selfie POV. The built-in camera controls are perfect for changing modes, starting and stopping recordings, and adding HiLight tags while on the move. 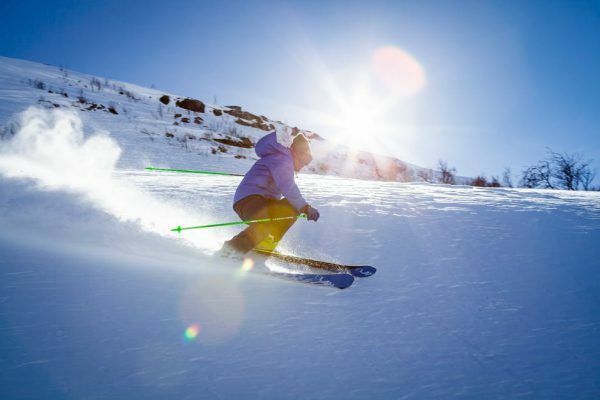 The product works with all Hero models, thereby offering a good alternative, albeit a bit costly, to pole mounts during skiing. 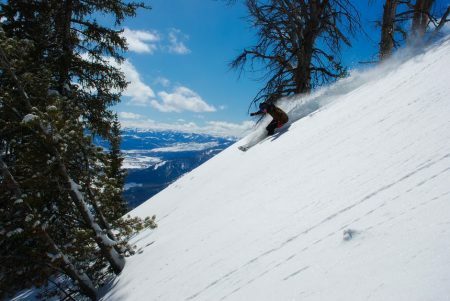 The most useful tip a professional skier or snowboarder will give you is to incline your camera lens just a bit lower than you actually want it to be. This helps in getting your arms and legs in the frame while you are recording the front view. It may be a good idea to keep your camera vertical instead of the usual horizontal position while you are recording with the device facing you. This ensures your whole body fits into the frame. You can rotate the footage later on while editing; so you don’t need to worry about that. If you are using a high-end model such as the Hero 5 or Hero 6 Black, you may want to utilize the full range of features by manually adjusting the settings. Although videos at 720p resolution work alright, the option of shooting in 4K at 60 fps and 1080p at 240 fps may seem a bit too enticing to resist. However, you need to remember that the higher the resolution, the more powerful your computer needs to be in order to edit the footage. The latest Hero models come with the electronic image stabilization (EIS) software which cuts into the picture and neutralizes the camera movements without affecting the resolution. Skiing involves a lot of jerks, and you will learn over time that no amount of tightening the mounts is going to let you capture a perfectly stable shot. This is where the EIS comes into play, enhancing the quality of your recording and making the output video far better than the one you began working with. Color correction and grading with GoPro’s Protune is yet another great way to manually control the exposure, ISO, white balance and other minute details of your shots, especially in bright light. It is recommended to turn the Protune feature off at night though, since it may result in grainy recordings. Finally, make sure you have a good story to tell. Snowboarding videos can be pretty boring if they don’t have a story. Over-viewing the scenery, mixing POV shots and adding some captivating music while editing are a good way to make your videos entertaining. If you are buying a GoPro, chances are they are going to provide you with the basic mounts along with the camera itself. However, those are never enough, and you need to buy specific accessories separately in order to reap full benefits from your GoPro. The only thing to remember here is the kind of accessories you actually require. GoPro products don’t go easy on the pocket; so I hope this article helps you narrow down on your choices.